Warehouse 7 Lofts is a luxury mixed-use building featuring high end condo and apartment residences as well as over 36,000 square feet of lower level retail space. The building offers 30 floor plans exposed brick and timber, oversized windows, and high-end finishes. Located in downtown St Louis, residents are just steps from the all the action including restaurants, sports, shopping, and entertainment. 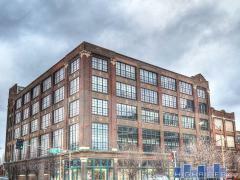 Have any comments or questions about Warehouse 7 Lofts? Ask your question and/or share your thoughts about this Building.